We had the opportunity to facilitate a review for three puzzles from White Mountain Puzzles. In the year 1978, the very same year Ben and Jerry's Ice Cream was founded in Vermont, two entrepreneurs in New Hampshire started a small poster company which would evolve into White Mountain Puzzles. While Ben and Jerry's rapidly became a national brand, sold to food giant Unilever in 2000, White Mountain Puzzles grew gradually. It is still owned by Cronan Minton and Ted Wroblewski and soon their respective sons will take over the business. Cronan and Ted are proud that White Mountain Puzzles has grown into one of the top puzzle brands in the United States. It may have taken them longer than Ben and Jerry's, but the satisfaction of having their sons involved with the business is worth it's weight in gold. White Mountain Puzzles is still located in New Hampshire in the White Mountain National Forest in a beautiful village dotted with turn of the century inns and B and B's. Every White Mountain Puzzle is manufactured in America, and every year the quality improves. All the puzzles are interlocking and made from sturdy blue chipboard on recycled paper. They have added a new children's line, expanded their selection of 300 puzzles that are EZ Grip puzzles, and introduced some family puzzles with large, medium and small pieces for family fun. 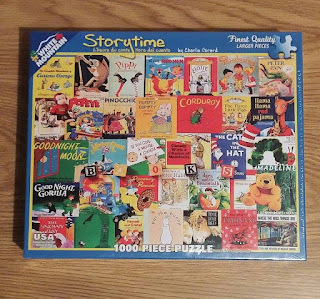 We received three puzzles from White Mountain Puzzles, the ABC Floor Puzzle, The Story time Puzzle and The United States Puzzle. The ABC Floor Puzzle has 24 jumbo pieces that are designed for little hands of those three and older. These 24 pieces combine to make a giant 2"x 3" puzzle. My grandson who is 4 wasted no time in putting this together. He told me the names of the animals and letters that he recognizes. He likes to put it together and take it apart to show us he can do both by himself. He is beginning to learn his ABC'S, I think this puzzle will be a useful tool in helping him with that. 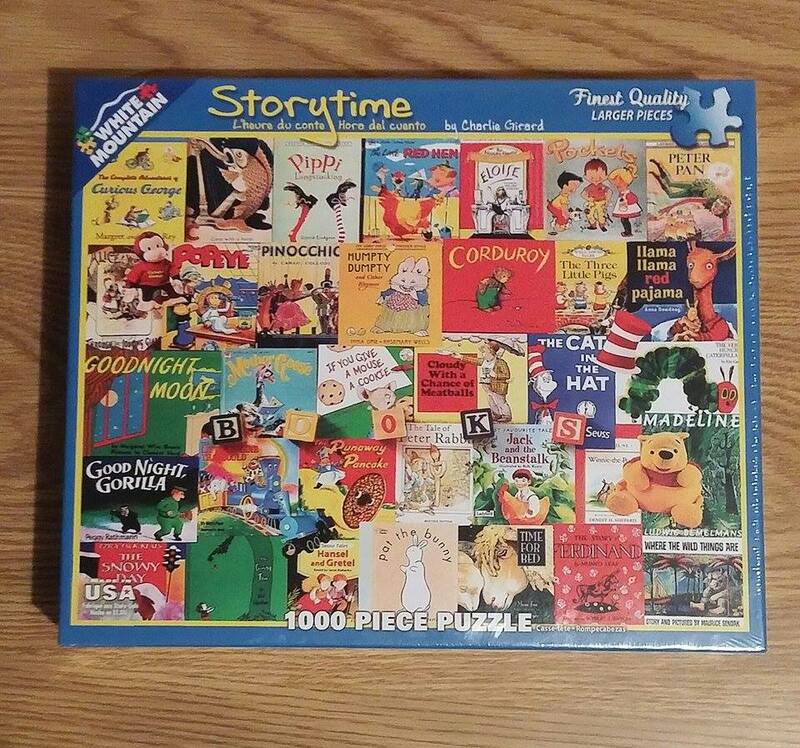 The Story time Puzzle is a collage of classic bedtime stories. This is a fun puzzle for the whole family with 1000 pieces to work with. It's my favorite of all three puzzle. It brings back memories from my own childhood, some of these books were my favorite growing up such as, Corduroy- remember that cute little bear? What about Pippi Longstocking and of course Winnie The Pooh and many more. Charlie Girard is the artist. The third puzzle we received is of the United States of America. This puzzle has 300 pieces and is an EZ Grip puzzle from the artist Erica Kimball. The U.S. puzzle is the perfect alternative to flash cards, with easy to read font and colorful illustrations. Like mine, your kids will be more eager to learn the states and their capitals, with this fun puzzle. The images can also inspire conversations about the geographical and cultural differences that abound across the U.S.A. The finished size of this puzzle is 18" x 24". These are great for kids and they also have a U.S.A. State and Regional puzzle category. All three puzzles that we received were of excellent quality. I like a few things about the puzzles for little ones. I like the durability and fun attractive colors of the puzzle pieces. The pieces are large and seem to be thicker for little hands. They come with fewer pieces, on an average of between 24-100 pieces per puzzle. I like that White Mountain has a variety of advanced puzzles. These are the kind we like to do as a family. Whether it is all of us as a family or only two of us working on a puzzle, it is a relaxing time and we usually have some good talks over a great puzzle. Puzzle time can encourage family time, and exercise the mind. Puzzles can help to teach logic and encourage concentration. White Mountain Puzzles are a fun way to memorize facts and spend time learning. This is a great way to get children to spend less time with digital devices. The customer service and affordability is fantastic at White Mountain Puzzles. Check them out for yourselves! I agree with these fun products. We had a US map puzzle growing up so I was always very good about know where the states were.